Welcome to paradise - where peace, tranquillity and the unique beauty of the past still remain. Whangaroa Harbour is a jewel amongst the bays that encircle the surrounding coastline. The area is steeped in history – from the times of first Maori settlement to whaling, early missionary settlement, kauri gum digging, logging and milling. A safe anchorage and great fishing – the harbour is famous as the 'Marlin Capital of New Zealand'. It remains unspoilt and off the beaten track – a true New Zealand treasure. 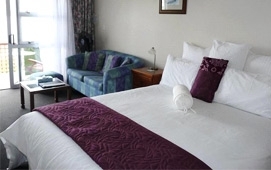 Whangaroa Lodge Motel, overlooking the harbour under the gaze of St Pauls Rock, is the perfect place from which to explore the area. 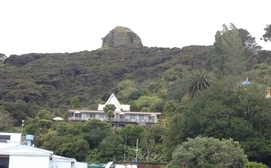 A short walk takes you to the Whangaroa Sport Fishing Club / Whangaroa Marina, or up St Pauls Rock. Hire a kayak, charter a boat or book a water taxi to explore the area. Or explore the Far North by car – Cape Reinga, Doubtless Bay or the Bay of Islands. Just had to write and say thanks for having me up to stay in your fab new Lodge. I stay in a lot of hotels as you know but yours would have to rate as one of the best in recent times... certainly offering great value for money! For starters the view, the view, the view... simply fantastic. The bed was the most comfortable Ive slept in too... a very nice added bonus after our serious 2 days fishing. The newly renovated rooms were practical and stylish. Clearly you went out of your way to look after me... but actually no, you didn't. You were simply looking after all there in the same manner which I observed went way beyond the norm. 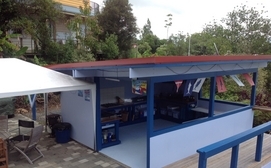 Being able to look at your trailer boat from in front of your room whilst it sits in a marina berth for a paltry $18 per night, not only offered great piece of mind, but also obviously very easy access. Literally a 3 step process at the end of the day... off the boat and into the Game Club... then out of the club and into your lodge. "Booked for 3 nights stayed 8!! A Gem!!" Totally bowled over by the setting, our room was on the first floor with stunning views over the harbour. All the rooms have harbour view but being slightly elevated was the best. Our hosts / owners Judy and Craig were very welcoming and simply superb! Nothing was too much trouble including cooking as amazing supper for all the guests using fish from some guests successful fishing trip. Apartment was well equipped, spotless and very comfortable. Wish we could stay! !